Syria Solidarity UK: The World Food Programme has shown aid drops are possible—now it’s time for the UK to show what it can do. The World Food Programme has shown aid drops are possible—now it’s time for the UK to show what it can do. Jo Cox MP asked a good question in Parliament today. Now that the World Food Programme has shown aid drops are possible in Syria by dropping aid to Deir Ezzor, isn’t it time for the UK to bring its expertise to help? In Daraya, women continue to protest the starvation siege. The local council stands ready to coordinate aid. 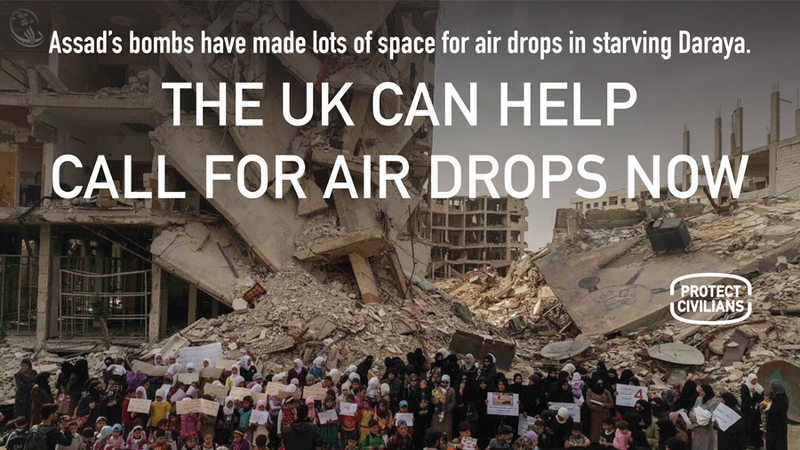 The damage of Assad’s bombs means there is all the room needed for a drop zone. So where is the UK? Other areas are also still desperate for help. And in areas where the UN has been able to bring food aid, the Assad regime has refused medical aid to pass. The UN even reports Assad’s forces removing medical supplies from convoys. Dropping aid only to regime-held Deir Ezzor while allowing civilians to go on starving in the many areas under regime siege is once again allowing Assad to manipulate UN aid to his own ends. Disturbingly, activists allege that the regime is diverting World Food Programme aid in Deir Ezzor to its own militias. There is an urgent need for transparency from the World Food Programme on what verification measures it has in place. Call on the UK to act now and drop aid to besieged civilians across Syria. Below are details of Jo Cox MP’s question in the House today, and the inadequate Government response. Daesh is of course is a particular threat to civilians in Syria, as also is the ongoing besiegement of communities across the country. With the Syrian regime continuing to block UN trucks, less aid is now reaching those communities than before the Cessation of Hostilities. Does the welcome news on Sunday that the World Food Programme was able to deliver 20 tonnes of aid to Deir Ezzor through a successful air drop demonstrate that the Foreign Office, along with DFID and the Ministry of Defence, should now examine again the possibility of air drops to all besieged communities in Syria? Mr Speaker, I pay tribute to the work that the honourable lady does in this particular area, and her knowledge of it. She’s right to recognise the extra work that is being done to ensure that aid gets through to those very difficult areas, and this is one of the focuses that is taking place as the Cessation of Hostilities begins to endure. We must make sure that those who have been caught up in this horrendous war are able to receive the aid that they require. MORE: Women4Syria in solidarity with the women of Daraya.